Steamboat Springs, CO - A SIX-POINT BULL ELK LOOKS UP in curiosity at the car passing through Marabou Ranch. Distracted, it steps aside at the last minute as horses rush it, attempting to drive the wild animal from their hay. Meanwhile, the ranch manager is out grooming 20K of corduroy tracks for cross country skiers, startling a flock of birds from their midday rest. On a still winter’s day, Marabou provides a pastoral counterpoint to the hustle-and-bustle of the Steamboat Ski Area, only eight miles to the east. Overlooking this idyllic western scene is the home of Wrenn and Mary Blalock. If you saWrenn walking down Lincoln Avenue, you might mistake him for a long-time local. In jeans, hiking boots, long-sleeve T and baseball cap, this second-home owner has embraced the Steamboat Springs lifestyle, and his home here reflects his love for the area. The Blalocks worked with Brooks Design-Build and Hamilton Construction of Steamboat, plus Georgia designer Jane Coslick, to create a home that resembles the architecture of Marabou’s owners’ cabins and lodge. 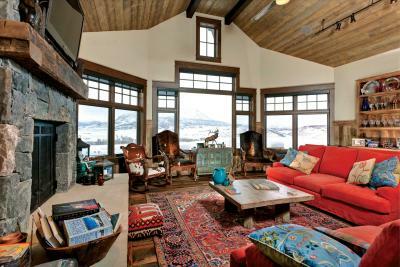 The result blends traditional Western elements with Americana accents, eclectic conversation pieces and the ultimate focal point: floor-to-ceiling windows that perfectly frame a jaw-dropping vieof Sleeping Giant mountain, with the Elk River valley in the foreground. “I do views,” Coslick says. “Wrenn and Mary’s house isn’t that big, but all the spaces move your eyes toward the view.” Huge decks overlook the valley, with plenty of room for the BBQ, beach chairs and Wrenn’s newest acquisition — a hot tub just outside the master bedroom. From Tybee Island, near Savannah, Ga., the Blalocks wanted a mountain home that distinctly reflected its ranch setting, rather than their Southern heritage. Still, the house exudes a sense of graciousness and hospitality that bespeaks their style. 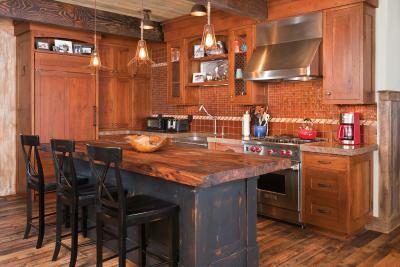 Wood — dark, natural and in many cases, reclaimed — is predominant throughout the 4,200-square-foot home. Wrenn appreciates the fact that Marabou’s amenities buildings are right down the hill from the Blalocks’ home. His son goes for massages and physical therapy while Wrenn gets in a workout in the exercise room. Mary’s preference is riding horses throughout the 1,717-acre ranch. “One of the neatest things is that the Blalocks were open-minded enough to do things different,” Hamilton says. He chuckles when he remembers the day the furnishings Coslick selected arrived by truck. No one was sure what to think when bright red appliances, turquoise chandeliers and a Victorian red door with art-deco-era etched glass were unloaded from the truck. One of the most cheerful rooms is over the garage. It showcases lipstick red Elmira Stoveworks 1950s retro appliances with state-of-the-art features. Plank flooring, leather kitchen chairs, blue cabinets, steer horns and cowboy art come together to create relaxing quarters that alloguests to be self-sufficient. Another remarkable room is Mary’s bathroom, where white marble stands in stark contrast to the dark wood elsewhere in the house. Hamilton says it adds a little “beach feel” to the house. “I was a blessed girl” to be chosen to design the Blalocks’ house, Coslick says. She went on “hunting expeditions” to find one-of-a-kind pieces, scoured antique shops and attended auctions. If Steamboat is remarkable, Marabou Ranch is a delightful surprise. When plans were announced to turn rolling wheat fields into a “refined ranching community of 62 exclusive homesites,” those more attuned to traditional mountain development were taken aback. “Working ranch” and “luxury homes” aren’t phrases that usually go together, but Marabou blends the two seamlessly. The ranch is one man’s dream. “Jeff Temple was the visionary,” says Marabou’s Scott Bell. Temple is a fourth-generation local, whose father helped to start the Steamboat Ski Area. Winner of the Steamboat Springs Sustainable Business of the Year Award in 2007, Marabou has been recognized for its “smart development,” from riverfront reclamation to green building resources. Owners enjoy not only luxurious spa and workout facilities, a private theater and luxurious lodge, but also unique amenities like a quarter-side of Marabou beef, miles of mountain bike/cross country ski trails, a tubing hill and “master guides” from Olympians to fly-fishers who teach guests the local ropes. Like the Blalocks’ home, Marabou itself is both a casual country ranch and a refined retreat.